Agra - The city known for the famous monument of love - the Taj Mahal. Taj Mahal was constructed by the Mughal Emperor, Shah Jehan. It is said he built this monument in the memory of his beloved wife Mumtaj Mahal. The Taj Mahal is ethereal at any part of the day - blushing in the rosy glow of dawn or sunset , appearing like a pearly mirage in the moonlight or reflected in the pools of the garden. Perhaps the most moving view of the Taj is from an octagonal tower in the Agra Fort further along the river Yamuna. There are very few cities in the world that can match the history and heritage of Agra. Located at a distance of 204 km south of Delhi, Agra is the single most famous tourist destination of India. Situated on the west bank of River Yamuna, Agra is a part of the great Norther Indian plains. The architectural splendor of the city is reflected in the glorious monuments of medieval India built by great Mughals who ruled India for more than 300 years. In the mid 16th century and earlier 17th century Agra witnessed a frenzied building activity and it was during this time when the symbol of love Taj Mahal was built. The buildings made during this era were purely in the contemporary Mughal style and of very high quality which is still reflected in what ever monuments remain in Agra. Agra Fort : The construction of the Agra fort was started around 1565 when the initial structures were built by Akbar. Shah Jahan replaced most of these with his marble creations. Some however survived, among them are Delhi Gate, Amar Singh Gate, Akbari Mahal and the Jahangiri Mahal. The fort is crescent-shaped, flattened on the east with a long, nearly straight wall facing the river. It has a total perimeter of 2.4 km, and is ringed by double castellated ramparts of red sandstone punctuated at regular intervals by bastions. A 9mt. wide and 10mt.deep moat surrounds the outer wall. An imposing 22mt. high inner wall imparts a feeling of invincible defensive construction. The route through the Amar Singh gate is dog-legged. The layout of the fort was determined by the course of the river, which in those days flowed alongside. The main axis is parallel to the river and the walls bridge out towards the city. 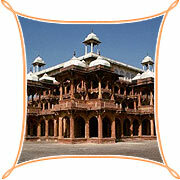 Fatehpur Sikri : A royal city perfectly preserved, Fatehpur Sikri provides a marvellous escape into the past. Akbar embarked on the construction of a new capital here when a prophecy of the birth of a male royal heir, by the Sufi Saint Salim Chisti of Sikri, came true. Imposing gateways and light - hearted palaces were built in red sandstone within this fortified city only to be abandoned a few years later. Sikandra Fort : Welcome to Sikandra, a supurb of Agra, only 13 km. from the Agra Fort, the last resting place of the Mughal emperor Akbar. Akbar was the greatest of the Mughal emperors and one of the most secular minded royalties of his time. He was the heir to a long tradition of oriental refinement, a great patron of the arts, literature, philosophy and science. A visit to Akbar's monument opens before one, the completeness of Akbar's personality as completely as the Taj Mahal does of Mumtaz Mahal's. Akbar's vast, beautifully carved, red-ochre sandstone tomb is set amidst a lush garden. Akbar himself planned his own tomb and selected a suitable site for it. To construct a tomb in one's lifetime was a Tartary custom which the Mughals followed religiously. Akbar's son Jahangir completed the construction of this pyramidal tomb in 1613. Khaas Mahal : Situated in between the golden pavilions is the Khaas Mahal. Built entirely of marble by Shah Jahan, the palace demonstrates distinctive Islamic-Persian features. These are well blended with a striking range of Hindu features such as chhatries. It is considered to be emperor's sleeping room or' Aramgah', The Khaas Mahal provides the most successful example of painting on a white marble surface. Diwan-E-Khaas : To the right of Sheesh Mahal is Diwan-e-Khaas, the Hall of Private Audience. Presently entry is not allowed inside Diwan-e-Khaas but the fine proportions of the building can easily be appreciated. The marble pillars are inlaid with semi-precious stones in delightful floral patterns. Agra is also famous for the leather items. Agra is the hub of hand made leather items. Particularly the Agra jail inmates are make these items which are sold to give them a decent earning. The local artisans are also good at making leather chappals (sandals), purses, bags, decorative items and many more such leather product which instantaneously attracts your attention. In the handicraft craft emporiums and shops there are sandal and rose wood items even though there are no rose or sandal wood forest nearby. The shops also have brass decorative pieces and stone carved images. 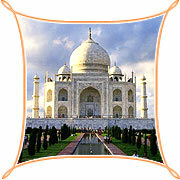 Agra is also famous for the Zari and embroidery work, Stone inlay work and durries. Air : Agra is one of the hottest tourist destinations in India and all facilities have been provided for the easy access to this place. It has its own airport which connects Agra with all the major places in India. The Agra airport or the Kheria airport has all the major domestic airlines having their services to this place of the Taj. Rail : Agra is a major railway station with almost all the trains to south India, Mumbai and many trains to Calcutta stopping here. Agra city is visited by the "Palace on Wheels" .The Rajdhani and Shatabdi trains have also their stoppage in Agra. The city is well connected by trains to almost every corner of the nation. Road : Agra has the National Highway Numbers 2, 3, 11 passing through it. So the premier tourist destination of India, Agra is also well linked by bus services to other places in the State as well as outside the state.